There you go. He sat on “them.” Mark and Luke only have a colt. John, hedging a bit, claimed it was a donkey’s colt. But that’s still singular! Why did Matthew’s author seem to have Jesus straddling two different animals? An easy answer was Matthew viewed Jesus’ life as the fulfillment of Jewish prophesies. One of those “predictions” came from Zechariah. If you read Zechariah 9:9, with its longing for the coming of a humble king, you’ll run across a reference to . . . one animal. But Matthew, interpreting that ancient verse, conveys it so literally that it’s as if Jesus rode multiple mounts. In my New Revised Standard Version translation, Zechariah’s statement is, “. . . riding on a donkey, on a colt, the foal of a donkey.” Whoa! I could imagine interpreting Zechariah’s verse so that three animals were provided for Jesus’ needs. Or two. Or one. Poor, poor Matthew. Whatever translation or interpretation he used, Matthew decided to play it safe. He, since we’re in baseball season, tried to cover his first century bases. As I recall, only a few chuckled at my failed efforts at humor. Maybe it was because people didn’t get my “joke.” Or maybe it’s because the people in the pews were smarter than me. They knew Palm Sunday was serious. And it is about serious choices. Every year, as Palm Sunday inaugurates Holy Week, I attempt to put myself in the midst of those folks welcoming Jesus. Whether it’s Mark’s low-key “many people” or Matthew’s more enthusiastic “a very large crowd,” what do I feel? On Palm Sunday, every Gospel writer transports me (and you) into the crowd. How dare I tell ‘em what I believed! Mostly I dislike “political” calls. If the caller is a recording—especially a robocall with a computer-generated voice—I hang up. If the caller is real, but speed-reading a prepared script, I hang up. And yet I also respect the message and the caller if the stranger contacting me comes across as sincere. My task involved attempting over 100 calls. I had a real and really interesting chat with a solitary person—yup, count my success on one finger—with a potential voter possibly interested in Senator Obama. Another Texas fella, a die-hard Republican (“Everybody in this household has always been and always will be Republican.”), listened politely for an awkward ten seconds and then our conversation ended. Whew. I bet 80% of my calls went to disconnected numbers or phones that rang and rang and no one ever answered. Mid-way through, I wondered: has Texas outlawed answering machines? I did leave a handful of messages, but I am not exaggerating that 80%. My pre-call fretting was unwarranted. Except for one guy in Texas’ Shrimp Capital, I never got to share why I thought someone should vote for the Illinois senator. What I should have worried about were my fingers going numb from punching so many disconnected numbers. But I made a choice. I didn’t have anything against the likes of long-ago candidates like Mike Huckabee, John McCain, or Hillary Clinton. All seemed pleasant and well-loved by their families. But I wanted to do something for the candidate I was supporting. If I wasn’t going to be “boots on the ground” in the campaign, I could nervously settle in by a phone and use my voice to share my convictions. And yet, did calling all those numbers matter? I think so. As Holy Week begins, all of us start in the Palm Sunday crowd. It is easy to just watch, to cheer from a distance. Then or now, we can shout with the multitude for a few moments, and then scurry home to safety. Doing nothing is forever tempting. But our life, and the invigorating life of our beliefs, is about choices. 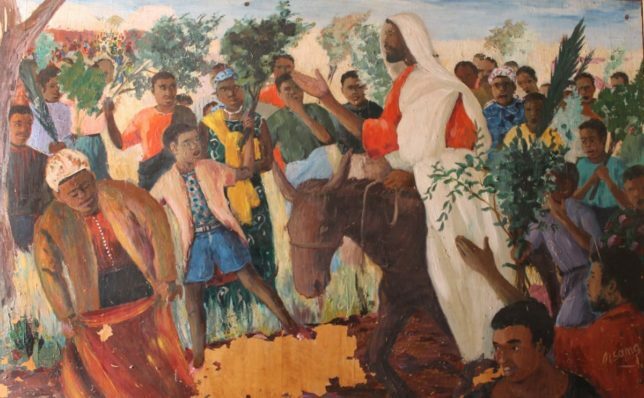 Each Gospel, in the time of Holy Week—Palm Sunday through Easter—has extensive, unique accounts of Jesus’ actions. I don’t think the details were polite history lessons about Jesus. They were written with passion about passion to help us choose if we will remain in the safety of the crowd or risk the daily, demanding call of faith. Nervous energy? Those inconsistencies in the stories take the people that really study the Gospels to figure out. As for us, we will serve the people and love them really hard. Thanks! And to keep loving them really hard . . . This is a tough one for me and I hope I agreed to follow the lead of this small, energetic group of new Christians. You see what they want to do embarrasses me to death. Let me also add that we do not have a church building. We meet in one another’s homes. Okay. They want a procession. Not so remarkable in itself but they want to process down one of the strip malls, go into Shoney’s and during breakfast (it opens at 6:00 and the domestic workers can participate before work) celebrate Communion! Gulp! I put my Divinity school degrees in my pocket, forgot the lofty pulpit (kinda) at Asbury where I thought I could take off in flight at any minute, tried not to look scared and said, “okay.” I wish I could have been as enthusiastic as they are – I’m rather petrified. But, I guess that’s how NEW Christians act. And, they are mostly new within a year. Watch out for those 12-year-olds. They may be listening to what you say!! Pat, it sounds like a wonderful, unnerving Palm Sunday! !